Valentine’s Day happens every year and no one is ever ready so as your reminder this year we thought we’d tell you all the things you didn’t know about this saint’s day. 1. This romantic holiday actually started as the Roman festival of the Lupercalia which was observed from the 13th-15th February. It was observed in order to avert evil spirits and purify the city by releasing health and fertility. In fact, the Lupercalia festival was a reinvention of an earlier pre-Roman festival called Febra which is where the month of February got its name. St Valentine’s Day was created by the Christian Church in an effort the Christianise the celebration. 3. In fact, there are about 12 different St Valentines in total. 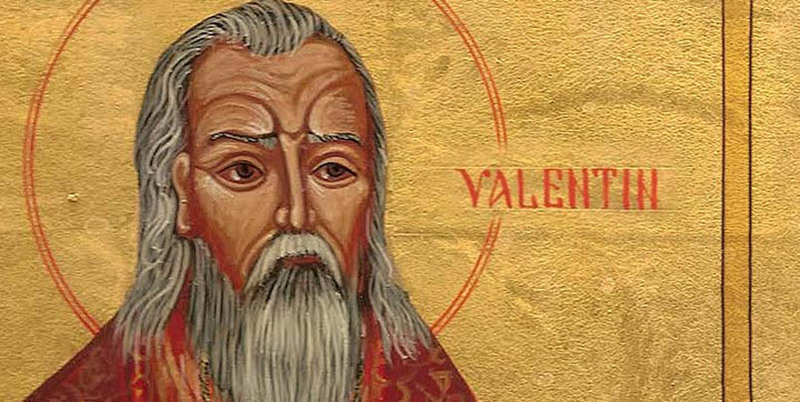 St Valentine’s day is in honour of St. Valentines of Rome, however, it was a very popular name for its time as “Valentinus” meant worthy, strong or powerful. The official Roman Catholic roster of saints shows about a dozen who were named Valentine. There was even a Pope Valentine in AD 827 who only served for 40 days. 4. As well as being the patron saint of engaged couples and happy marriages St Valentines is the patron saint of beekeepers, epilepsy, the plague, fainting and traveling. 5. Chaucer may have been the one to create Valentine’s day as we know it. It wasn’t until the 1300s that it became definitively associated with love. Before this, it was seen as the day that marked the beginning of birds’ mating season. No record exists of romantic celebrations on Valentine’s Day prior to a poem Chaucer wrote around 1375. In his work “Parliament of Foules,” he links a tradition of courtly love with the celebration of St. Valentine’s feast day–an association that didn’t exist until after his poem received widespread attention. The poem refers to February 14 as the day birds (and humans) come together to find a mate. When Chaucer wrote, “For this was sent on Seynt Valentyne’s day / Whan every foul cometh ther to choose his mate,” he may have invented the holiday we know today. 6. Many believe the X symbol became synonymous with the kiss in medieval times. People who couldn’t write their names signed in front of a witness with an X. The X was then kissed to show their sincerity. 7. Valentine’s Day greetings were invented in the 15th century and it wasn’t until the 17th Century in Britain that people started the tradition of exchanging cards or letters. The first mass-produced Valentine’s Day cards appeared in the 1840s. Today 1 Billion Valentine’s Day cards are sent a year. The only holiday that outstrips Valentines in card sending is Christmas. 8. While more than 35 million heart-shaped boxes of chocolate will be sold for Valentine’s Day. Richard Cadbury from the Cadbury chocolates’ family is responsible for the earliest box of Valentine’s Day chocolates. In 1868, he gave chocolates to his beloved in a heart-shaped box. He apparently also made the boxes more unique by using his own paintings to decorate the box lid. 9. According to surveys, 220,000 is the average number of wedding proposals on Valentine’s Day each year. However, the official world record for the longest marriage for a living couple belongs to Herbert and Zelmyra Fisher, who were married for a total of 86 years and 290 days, before Mr. Fisher passed away. Talk about a marriage that lasts a lifetime. 10. Every Valentine’s Day, the Italian city of Verona, where Shakespeare’s lovers Romeo and Juliet lived, receives about 1,000 letters addressed to Juliet. 11. In France, there used to be a Valentine’s Day custom called “The Drawing For Love”. Single people of various age groups would enter into houses that were opposite each other and call out through the windows till they paired up. If a male wasn’t happy with his partner, then he could leave her and pair up with someone else.The women who were left single would build a large bonfire and conduct ceremonial burning of the pictures of men who left them high and dry — cursing was included. Of course, it’s easy for feelings to spiral out of control (whether good or bad) and when things got out of hand (as expected), the custom was eventually banned by the French government. 12. It is better to have loved and lost than never to have love at all. The Qixi Festival is a celebration of love that is based on the love story between a weaver girl and a cowherd. The weaver girl was actually a celestial being; the cowherd, mere mortal. They fell deeply in love and had two children together before they were forced to part, separated by a river until the end of days.Magpies took pity on the two and form a bridge for them every year on the 7th day of the 7th lunar month of the Chinese calendar, reuniting the two and their children for a brief but special moment. Today, the festival is also known as the Magpie Festival as well as the Chinese Valentine’s Day. It inspired similar celebrations in Japan, Korea and Vietnam. 13. The phrase “wearing your heart on your sleeve”, comes from the popular Middle Ages tradition of young men and women would drawing chits from a bowl, to know the names of their valentines and then, would wear that name on their sleeve for the entire week. 14. Don’t worry if you miss Valentine’s Day on February 14th as because of the abundance of St. Valentines you can choose to celebrate the saint multiple times each year. You could pick from November 3rd, January 7th or July 25th, the Eastern Orthodox Church officially celebrates St. Valentine’s day twice on July 6th and July 30th so take your pick.